First off - thank you all so much for your support of Rue! The Twitter, Facebook, and list-serve have grown so quickly, and we're seeing it pop up on blogs everywhere! Thank you, thank you! Believe me when I say we are working our butts off to make sure the premiere issue impresses. But now, back to Martha's Vineyard. 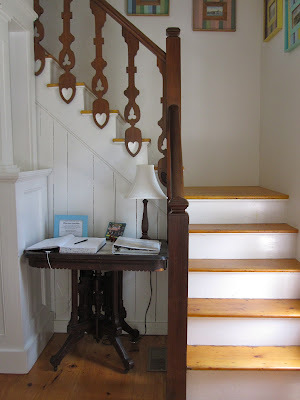 Nate's cousins rented a beach house in Oak Bluffs and it was oh-so charming, I immediately started snapping pictures when I walked in (even though everyone was lounging around eating breakfast - they've seen the blog, they understand). 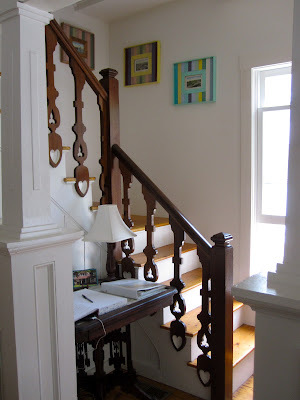 The old oil lanterns and the thrift store art hung in a column add to the charm of the space. 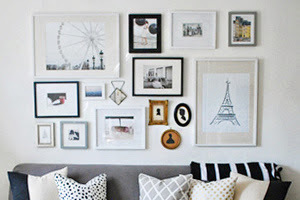 And how great does that dark espresso-colored mantel look against the white wall? 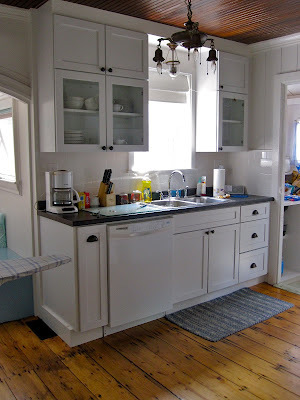 Sign me up for striped floors! The entire place was painted white with accents in various colors of water - teal, sky blue, grey, etc. Pretty sure the dining chairs are Pottery Barn. A message board replaces an old window. Charm, charm, charm! 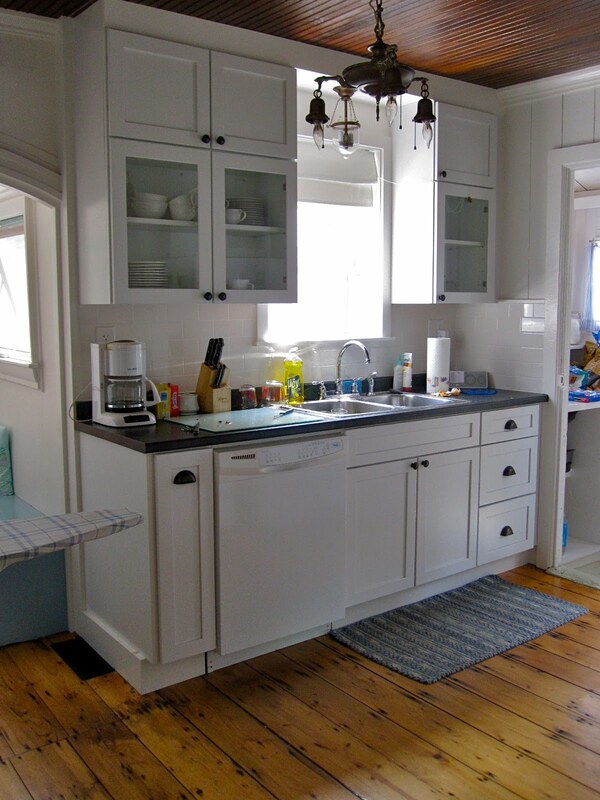 Such a sweet kitchen. With a bit of styling, this could easily make it's way into Coastal Living. Or Rue! 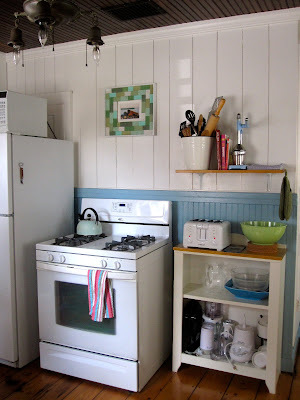 The wooden ceiling, antique light fixture, all white dishes, and subway tile are timeless, beautiful elements. 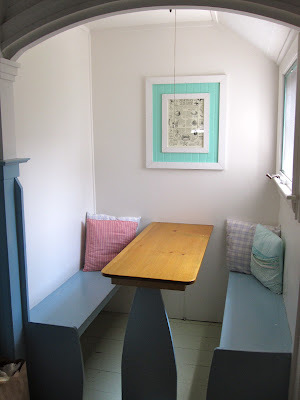 What's a beach cottage without a breakfast nook? This house had me at the staircase. 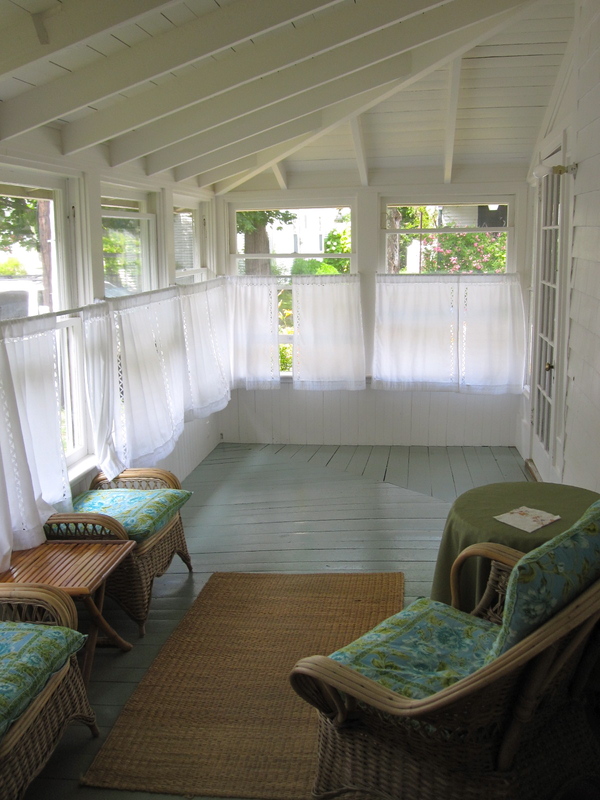 Enclosed sunroom off the front deck complete with wicker furniture and jute rug. 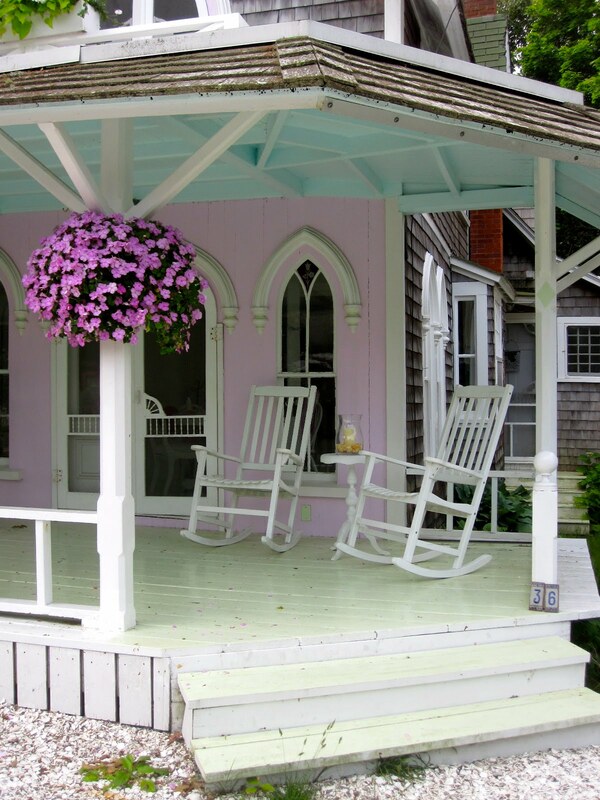 Rocking chairs everywhere! 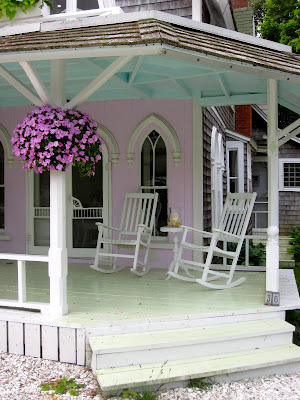 Every Gingerbread house in Oak Bluffs has a row of rocking chairs lining their massive front porch. Gingerbread house. Massive front porch. Rocking chairs. Oh, and did I mention the hydrangeas?! How could I forget? As soon as we pulled into Cape Cod, it was all I could talk about. They are just so BLUE! And they are EVERYWHERE! I just wanted to grab a pair of shears and go to town on them. What amazing centerpieces they'd be at my sister's beach wedding! 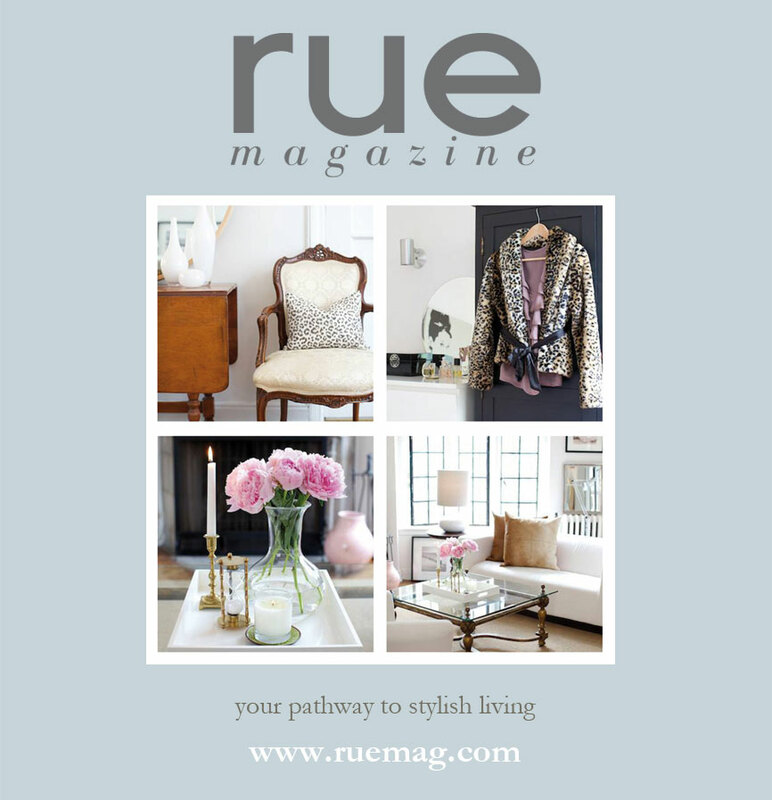 Words cannot describe my excitement in finally getting to reveal the up-and-coming Rue Magazine. The French word for street, Rue will be your pathway to stylish living, featuring interiors and entertaining content with a strong fashion and lifestyle sensibility. The premiere issue will debut on September 16 and will include spreads featuring acclaimed interiors experts, fashion designers, and of course, style bloggers, from around the world. Well, let me tell you, the bar has been set high. In fact, Anne and Crystal flew to New York last night to begin work on three shoots over the course of this week. 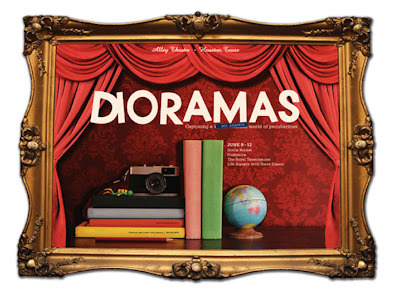 They'll be working with photographers who have shot for Domino, Traditional Home, and the New York Times. Be sure to follow them around Manhattan as they Tweet about their stylish adventures! While you're anxiously awaiting for September 16, you can receive updates on Twitter and by signing up for our mailing list on the newly launched Rue Mag website, www.ruemag.com! So spread the word! Come one, come all! 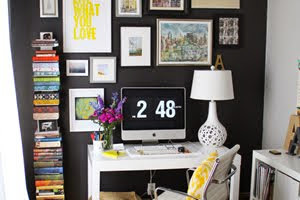 And heck, since you're already at your desk (or in bed), fan us on Facebook! I promise you won't regret it. 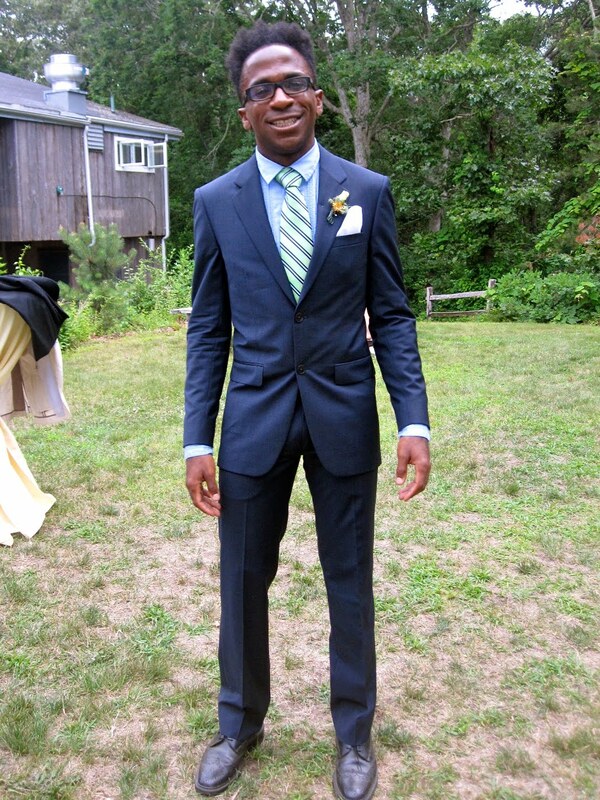 This past weekend I ventured by taxi, plane, car, and boat to attend a wedding on Martha's Vineyard. 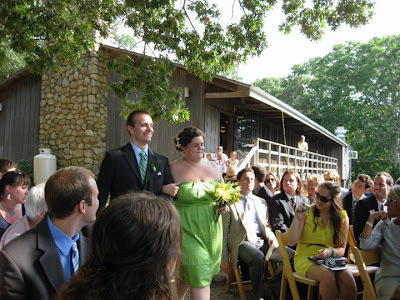 Nate's older sister, Emily, was marrying her fiance, Jon, and they chose the Vineyard after having spent a lot of time there throughout their relationship. They had such a picturesque event with tons of personal details. I got a bit camera-happy to say the least. (It's never good when you leave for three days and return with more than 400 pictures.) So I have edited greatly and will be sharing photos from my trip over the course of this week. And what better place to start than the big event?! 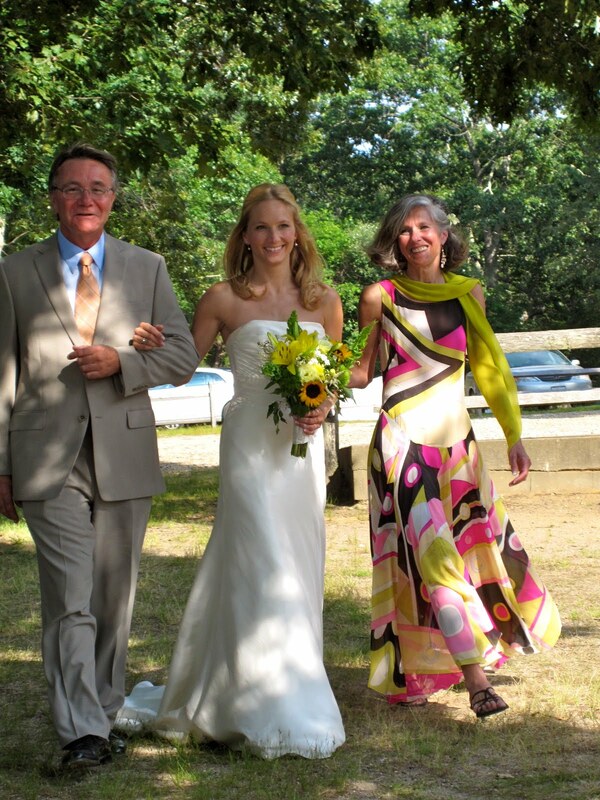 The wedding was held at the Sailing Camp Park near Oak Bluffs in Martha's Vineyard. The ceremony overlooked the water, and the weather couldn't have been more perfect. 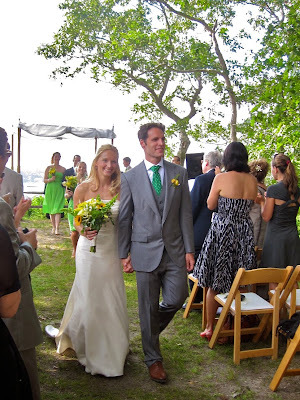 Nate's sister, Emily, looked perfect and naturally beautiful. 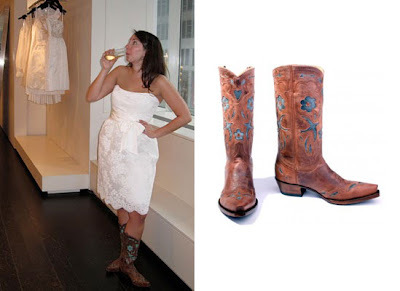 She clearly was not sucked into the mannequin trap in which so many brides find themselves. You know the look: the bride's face is pulled back by the five hundred bobby pins in their hair, and the gallons of hairspray and make-up perfect the wax-figure façade. Very Jersey Shore. This is my favorite picture from the day. 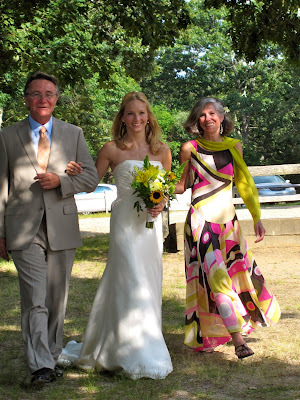 Emily smiling at her future husband while her father smiles at her. Oh my gosh, now I'm going to cry again. Emily's tousled, half updo complete with flowers was the perfect look for the outdoor setting. Can you spot the overly camera-happy me? I swear that camera never left my hand the entire weekend. Except when I went to refill my sangria. That is one good looking couple! 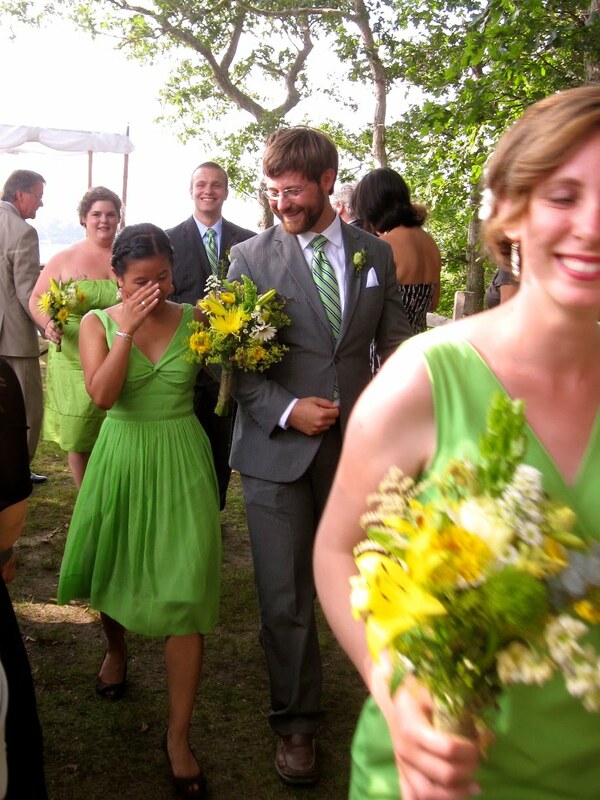 Bridesmaids went the J.Crew route, all wearing different styles in the same color. Groomsmen were told to wear a suit and had matching ties. The reception decor exuded a relaxed, country feel with white pitchers as vases, wildflowers, and light colors. And of course, I just LOVED the twinkle lights. As one friend put it, it was very "fairy-tale-esque." The couple used little chalk boards with the names of various Martha's Vineyard spots in lieu of table numbers. 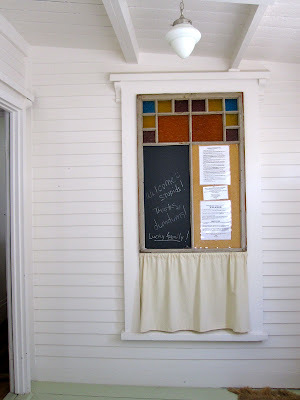 And instead of using a gagillion place cards, the seating arrangements were listed by table on old window panes. I thought this Quaker tradition was lovely and unique. 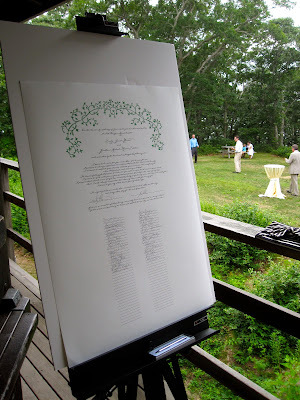 All guests signed the official wedding certificate as witnesses of the ceremony. 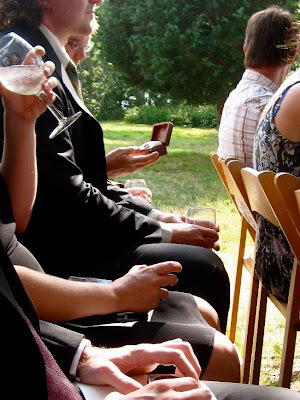 Another bit I really liked during this short but sweet ceremony was the passing of the rings. 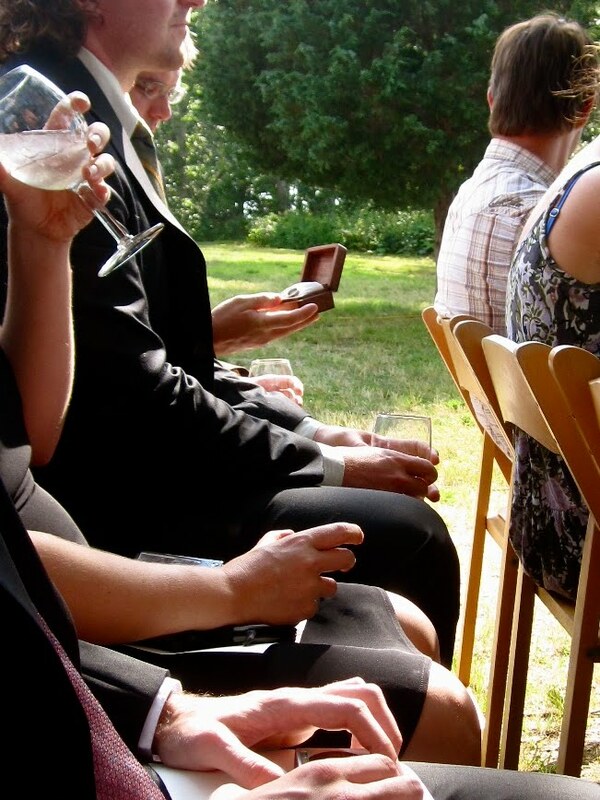 Everyone in attendance got to hold the rings for a moment and bless them as they wished. Here I am with Eleanor and Sara, two of Nate's cousins. Don't we look like rainbow skittles?? I love it. 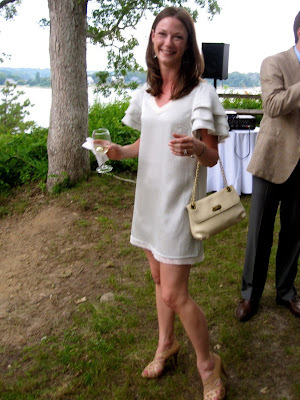 Loved the ruffled sleeves on her loose-fitting dress. I was not surprised to learn she bought it in Italy. Any of my readers abroad know of the designer/company Bonsui? **Note: the dress actually wasn't white. It was a very soft beige/blue. 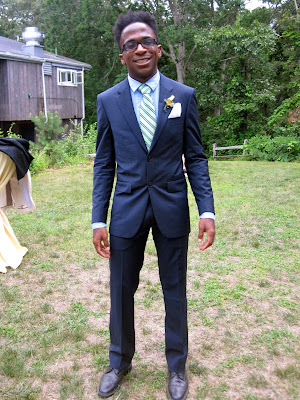 happened to be the best man, David from Brooklyn. Boy's got taste. Not a bad view from which to say "I do." Oo I made a rhyme! Cocktail hour complete with horse shoes and bocce ball and lot of sinking heels in the grass. Nate and I with his mom. 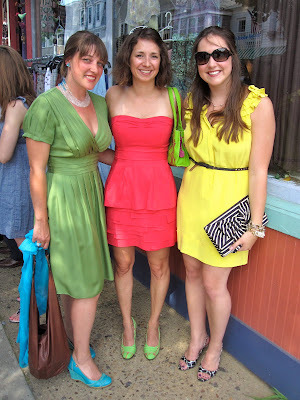 I loved how our bright dresses looked together! Siblings tearing up the dance floor. 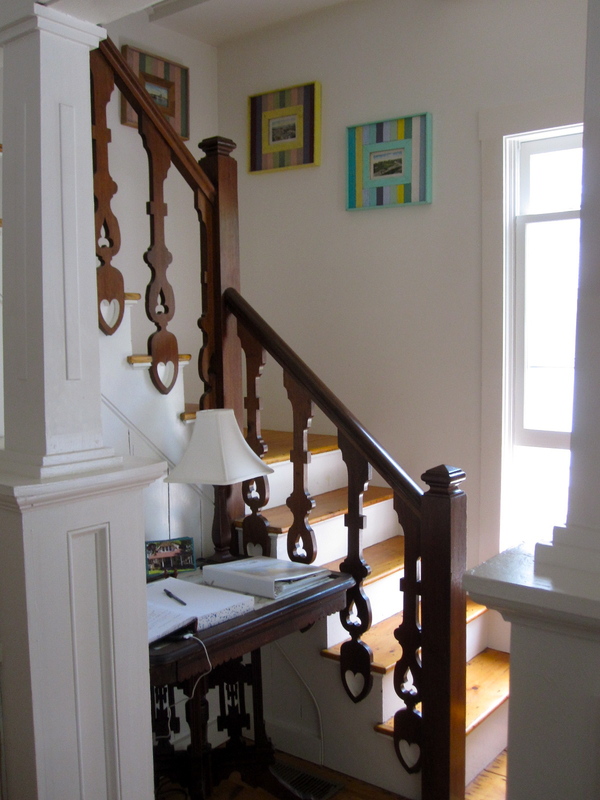 More pictures of Martha's Vineyard architecture and interiors to follow later this week! You may remember my post a few months back about a wedding shower for Nate's sister. 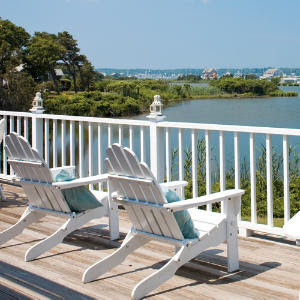 Well, this weekend we are headed to Martha's Vineyard for the wedding! I have never been and have only heard wonderful things about this small Atlantic island. I will hopefully have many, many beautiful pictures to share with everyone upon my return. 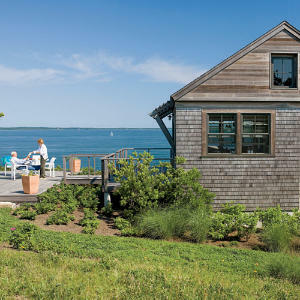 Until then, I will be enjoying views and beautiful shingled homes just like those from the pages Coastal Living. 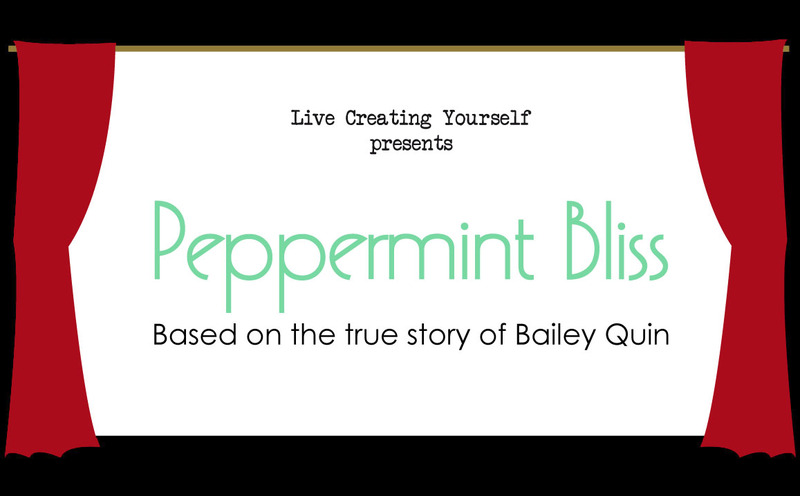 LCY presents: "Peppermint Bliss" based on the true story of Bailey Quin. 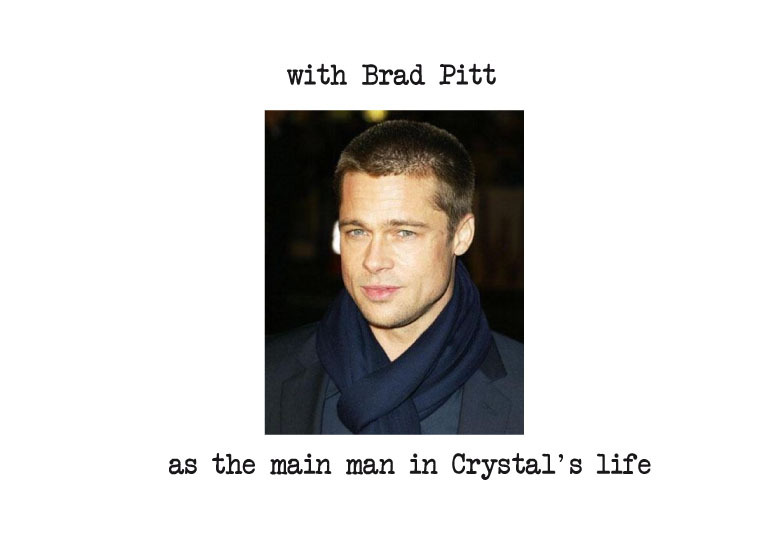 1. Who would play you in the movie about your life and why? 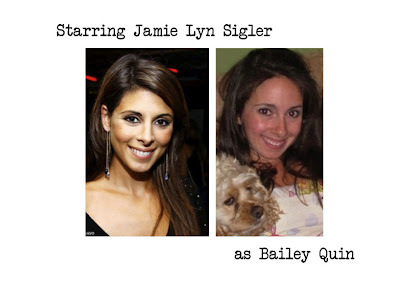 Jamie Lyn Sigler, because that is who I am told I look like most often. I am mostly sure it is just flattery. But on occasion, after a few cocktails, I believe it. I cannot attest to her acting abilities, but I do think she is a babe. 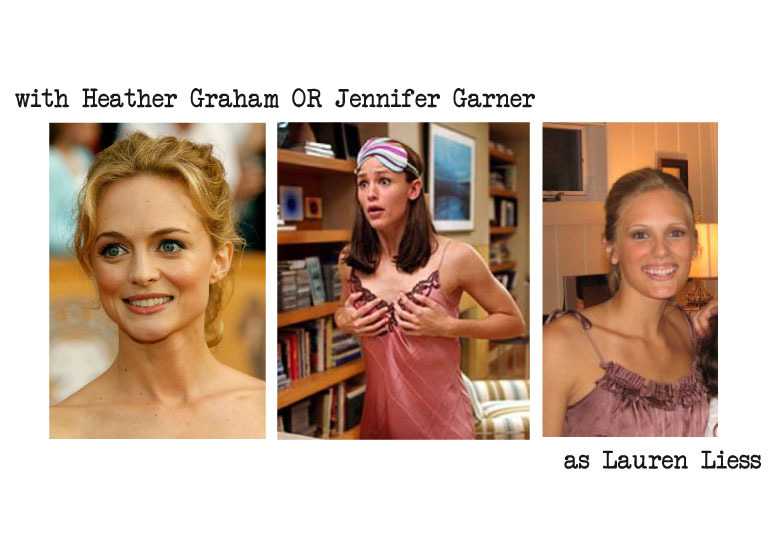 2. Who would play your love interest and/or best friend in the movie and why? 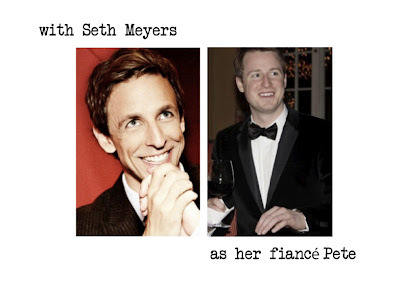 I think my movie would be a love story, and Pete (my fiancé) would be played by Seth Meyers (From SNL) based on appearance/overall demeanor. Or Bradley Cooper cause I wanna lick his face. 3. Where does the movie primarily take place and why? This is just impossible. 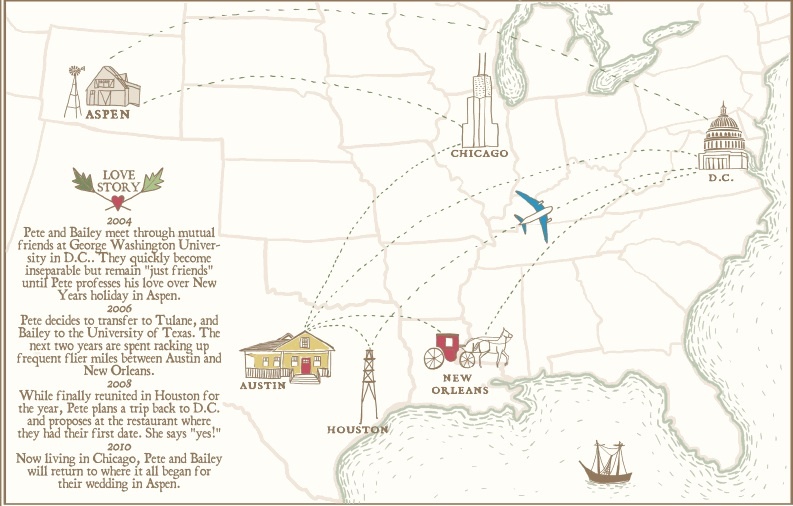 Pete and I have been together for six years and have lived in DC (together), New Orleans and Austin (apart), Houston (together) and now, finally, Chicago (together) over the course of our relationship. 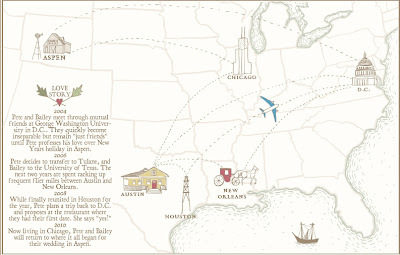 I think Wes Anderson would have to direct it, and each city would be its own chapter. 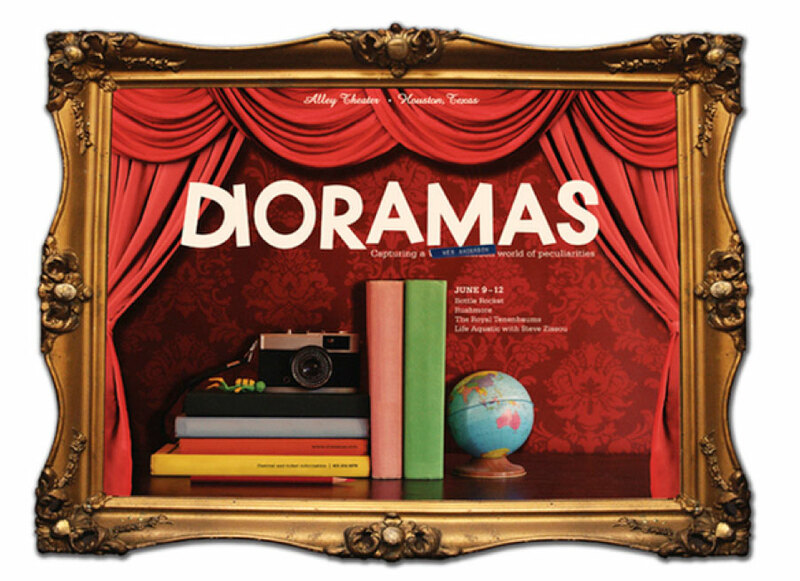 He would use those fabulous dioramas, and make us seem wickedly funny. Plus I’d finally get that hipster cred I so crave; which would be nice since Pete has refused my requests for him to grow an ironic mustache (surefire ticket into hipster hearts). takes place in every movie? I think our flitting about the country like a pair of drunken gypsies is enough travel for one film. Although…you COULD do a little Crossroads style roadtrip music video tracking our moves. 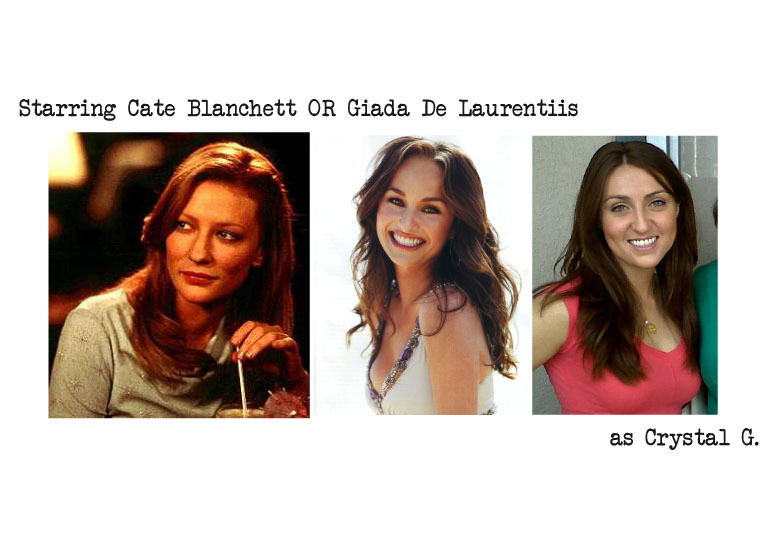 In fact, can I go back and recast Britney in my role? Because I love her. And if she were to play me I would require her to get a decent weave and wear a bra- which would cross a major item off of my to-do list. 5. The first scene is a shot of your feet walking down a street - what shoes are you wearing? My Old Gringos cowboy boots. I am probably wearing them in every scene. Think Steve Zisou and the red hat.! 6. What are some key wardrobe pieces you'd insist your character wear? My character would only wear dresses. I am proud to say I made it through a Chicago winter without AN singular pant (save jeans) gracing my big ol’ thighs. It wasn’t easy. Chicago tried to test my resolve with its bullsh*t wind and snow. But I survived, armed with only some spanx tights and a good attitude. I am vehemently anti-pants. 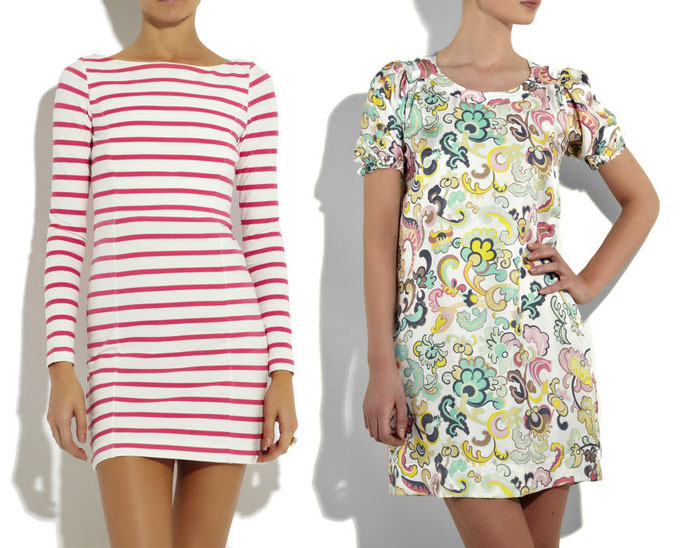 Dresses are just way more fun. 7. What song plays during the opening credits? Home by Edward Sharpe & The Magnetic Zeros. My new favorite tune. It has this quirky old school Prairie Home Companion vibe to it, and I think the words would be perfect “Home, let me come home! 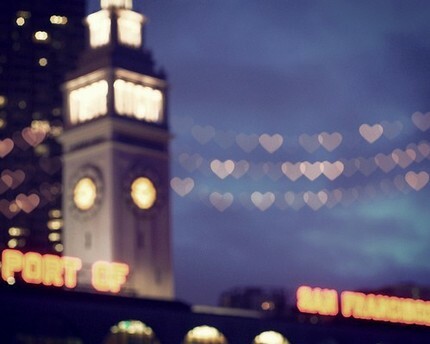 Home is wherever I’m with you." 8. What section of Netflix will the DVD be filed under: Action and Adventure, Comedy, Drama, Musical, Romance? Comedy. Peter S. Pie and I are truly, madly, deeply ridiculous human beings. 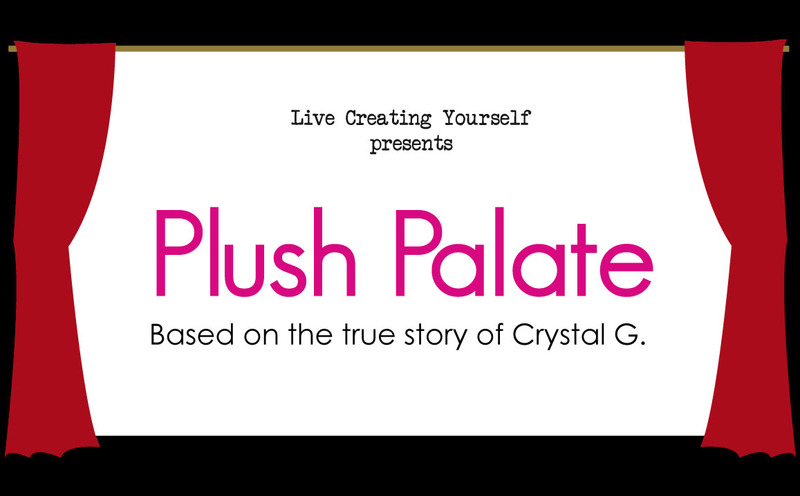 I just cannot think of anyway to categorize our story without leading views astray. 9. How big a role does your blog, Peppermint Bliss, play in the movie? Everytime I go to answer this question I imagine the scene from Royal Tenenbaums when Owen Wilson is being interviewed about his latest novella and he goes, “Well everyone knows that Custer died at Little Bighorn. What this book PRE-SUPPOSES is…Maybe he didn’t?” I think I sound about as ridiculous as that when I try to talk seriously to people about my blog. 10. What is the name of the movie and its tagline? And for the name of our movie...I still don't know! The only thing that keeps popping into my head is Home. As in "Home is Wherever I'm With You." As in our theme song. Because Pete and I have moved nearly 10 times in our 6 years together. He is my constant, wherever I am, if I can snuggle up in his nook, then I am Home. I likey him. Ok, now I am done being sincere, unless any movie execs are reading this. In that case I sincerely think you should consider making this movie. I smell Oscar. Alaina, thank you so much for letting me participate, this was seriously SO much fun. I have loved reading everyone's, and I am just dying to see yours! As always, thank you so so much, Bailey, for taking the time to do this! So much fun to imagine your movie.